Great British Bake Off’s north-east star Norman Calder presents his fourth video with the Press and Journal in association with Laing’s of Inverurie. The retired Merchant Navy radio officer from Buckie, won the hearts of millions of viewers with his unassuming manner and rustic cooking style when he appeared on the BBC phenomenon. The 67-year-old, who has been dubbed “Stormin’ Norman”, said he nearly backed out of the show after applying. But his excited family left him with no choice but to go through with it. Now, in an exclusive video series filmed for the Press and Journal website, Norman is using the luxury cooking equipment and kitchens of Laing’s of Inverurie, leader in the design, supply and installation of luxury kitchens for over 20 years, to teach burgeoning bakers new tricks. 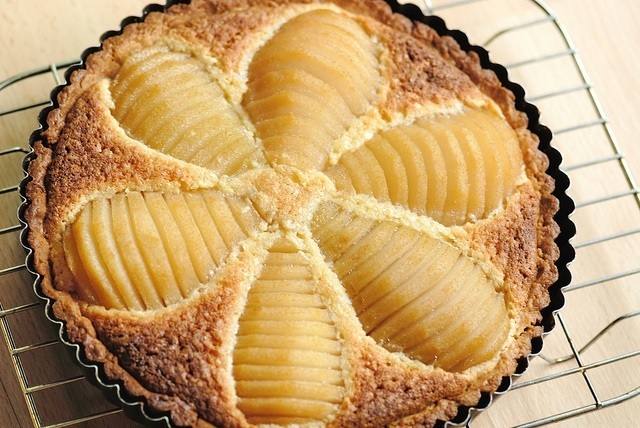 This month it’s his pear and frangipane tart…it looks amazing. You will also need 6 x 9-11 cm loose bottomed tart tins. Add the flour & butter to a food processor & pulse for a few minutes until well mixed. Alternatively just rub in the butter until it looks like crumbs then add the sugar and mix well. Finally bring the mix together with the 3 egg yolks. Wrap the paste in cling film and chill for 20 minutes, no longer otherwise it may crack easily. Once chilled a wee bit roll out the pastry to just less than 4mm. To prevent sticking it is best to use rice flour – much better than ordinary flour. Cut six rounds to fit your tart tins and use a palette knife to lift the rounds and pop in the refrigerator to chill whilst you make the frangipane. Cream the butter and sugar until light and fluffy then add the ground almonds, beaten egg and almond essence, mixing well before dividing equally between the six tart tins. 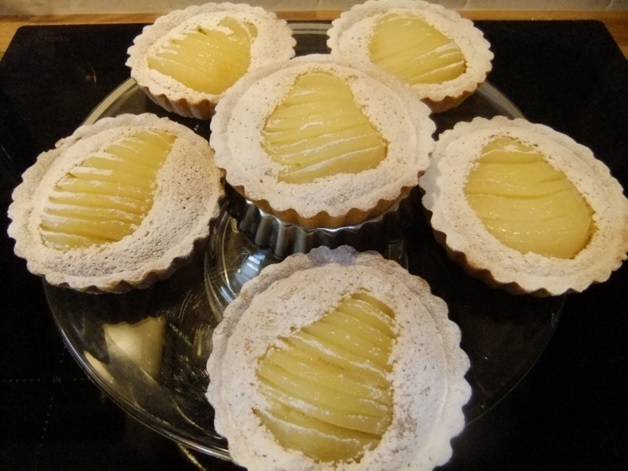 Slice each pear half into 2mm slices and using a palette gently place one pear half on top of the frangipane on each of the six tarts. The frangipane will spread evenly in the oven. Heat oven to 170 degs C and bake the tarts until light brown – around 15 to 18 minutes. Once baked and cooled finish off with a light dusting of icing sugar. These are excellent eaten on the day but I have had reports of them being better after 24 hours. Once you have made the frangipane using 3 egg yolks you will have three egg whites, ideal for making meringues. You don’t need to make them straight away as egg white will keep in the fridge in a sealed container for up to 14 days. For 3 egg whites you will need approximately 200g caster sugar for your meringues, nothing else necessary. Allow the whites to reach room temperature and whisk the whites until just prior to stiff peak then add the sugar a teaspoon at a time. If you wish you can warm the sugar in the oven, this will assist in the dissolving process of the sugar in the egg white. Transfer to a piping bag and pipe on to baking parchment. Bake at 100 degrees C for 90 minutes then switch oven to off and leave them in until cool. Note: This pastry doesn’t shrink when baking but does require delicate handling. Also no blind bake required, it always bakes perfectly.